This article has some interesting ideas as to how Gold may move in coming days. I have extracted this from SeekingAlpha.com . SNB surprised the market by its sudden decision to abandon the EURCHF floor and reduce its deposit rate further to -0.75%. Existing push factor of GLD such as current deflation, strong USD and holding cost is being pushed aside by negative interest rates and market concern about market stability. Global negative interest interest rates is attracting bids for GLD especially when conservative investors cannot hold their funds in safe deposit and bonds without attracting a penalty. Deeper market concerns over the ability to grow the economies of Europe and Japan without destabilizing the economic system. SNB Surprise served as a catalyst to bring these concerns to the front of investors mind and is responsible for the gap up of GLD. The (SNB) surprised the market on 15 January 2015 by announcing the abandonment of the floor of the Swiss Franc (CHF) 1.20 to the euro. In addition, the SNB announced that it has reduced its sight deposit rate from -0.25% to -0.75%, effective 22 January 2015. The rationale that the SNB imposed this floor in 2012 is to prevent importing deflation from Europe but it has done it at the cost of a ballooning balance sheet to GDP from at least 60% to 85%. The SNB has finally accepted that deflation of -0.1% for this year and have made it clear that even if they do prevent deflation from Europe, they can't prevent deflation from the U.S. through a strengthening USD. In this article, we will look at how the conflicting pull and push factors which affect the attractiveness of gold. In my previous articles, I have been bearish on gold as I consider opportunity cost of holding gold when the U.S. economy is rising and the fact that the strengthening USD will weaken gold. In addition, I have considered the fact that there is very little inflation worldwide given the low energy price. Hence gold would lose its allure as an inflation hedge, especially when it is increasingly clear that major economies like Japan and Europe is nearer to deflation than inflation. Even as I consider these factors to be relevant, it would appear that other factors are now raising to the forefront to challenge these push factors of gold. The most prominent factor would have to be the negative interest rates. We are seeing a number of major countries imposing negative interest rates. The latest and deepest negative interest rates come from the SNB at -0.75% of deposit rates. The European Central Bank (ECB) has set its deposit rate to -0.1% and there are Japanese Treasury Bills that are having negative interest rates. This is because investors prefer these treasury bills even when key interest rates are zero and they are willing to pay a premium for it. Negative interest rate means that investors have to pay the banks to keep their money and this has offset the cost of gold purchase. For investors who are conservative, they are not likely to invest into equities which they perceive to be of high risk. Given that they can't deposit their money safely in banks or bonds without attracting a penalty, they are more likely to be attracted to gold as a store of value. Then there is the risk of unintended consequences. With the ECB and Bank of Japan (BoJ) determined to ease monetary conditions further, they are increasing the risk that these actions will cause a bubble in the future. The issue is that inflation might surface in other form with all these QE efforts. These QE measures are described as emergency measures by the Fed and this is why they are being rolled back by the Fed right now. The question remains unanswered in the market as to whether a prolonged dosage of QE will actually help or harm the economy. We have to remember that the Fed used QE to purchase banks asset to restore confidence in the system and this is done with a bank stress test. The banks subsequently healed as investor confidence were restored and were able to lend as they have a clean balance sheet. They also have incentive to lend as the economy recovers amid a low interest rates environment. As the economy recovers, people consumes and we naturally see inflation which stands at 1.3% in December 2014. This will have been higher if not for low energy prices. There might be a question as to whether the banks started to lend first or the economy recovered and people consumed first before the banks were willing to lend. My opinion is that QE and the bank stress test cause the recovery in confidence first and the bank lending and consumption happened in tandem. The big question for Europe and Japan is that despite all these efforts in QE, we do not see a recovery in their economy. Europe is still having sub 1% growth and Japan has slipped into recession again with the second and third quarter of contraction in 2014. This might point to a bigger problem to their economies than what QE can solve. The SNB move to abandon the peg and lessen the deposit rate serves as a catalyst which brought the issue of negative interest rates to the forefront of investor's mind. This is a signal to investors that there might be a paradigm shift in how major economies will operate from now on. The fact that the SNB has to surprise the market instead of following the usual central bank communications strategy which has been the norm for the past 10 years also hints at future uncertainty. In this environment, we are likely to see more demand from gold. We can see this from the SPDR Gold Trust ETF (NYSEARCA:GLD) chart below. GLD tracks the performance of gold bullion after expenses and it is listed on the New York Stock Exchange. It is liquid with $27.54 billion of market capitalization and 17 million of last known daily transactions. Despite this liquidity, we see that GLD gap up on the SNB surprise. This is a clear sign that there are issues in the Europe and Japan which the market is concerned about. The market's concern seems to be that despite the QEs, Japan and Europe would not be able to solve their issues. The side effect of these QE besides the massive purchase of securities, is to resort to negative interest rates which is forcing conservative investors out of safe deposit. These issues have always come along with QE and the market assumption has been that the recovery prospect will outweigh the risk involved as mentioned above. 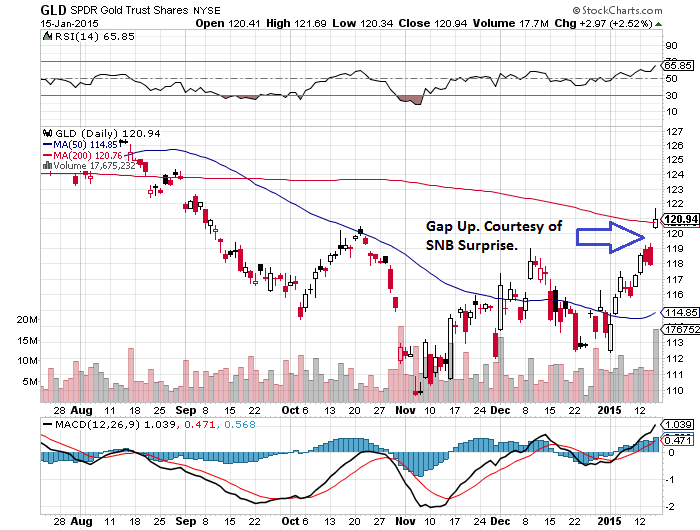 However the SNB surprise suggest otherwise and this is serving as a catalyst for these issues to surface and for GLD to gap up. Of course, the market has been wrong before and GLD was up from 2009 when the Fed started its first QE to 2011 when it was clear that the U.S. economy has recovered before GLD became bearish again. There is a possibility that this will be the start of a new bullish trend for the medium term if Europe and Japan is not able to get their act together. It would appear that even the strong USD cannot hold down GLD and this shows the depth of the market concerns.